Hello there! 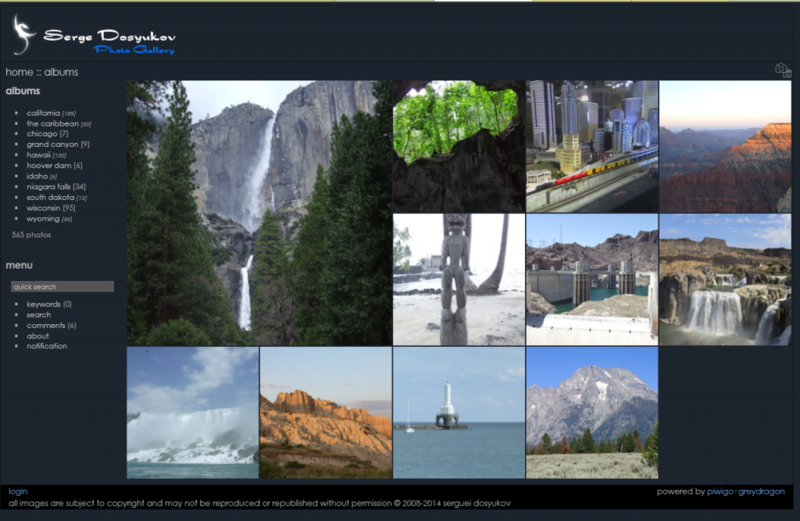 If it is your first visit here, you might want to subscribe to the RSS feed, visit Theme’s Forum threads or follow on Twitter for updates on Piwigo, Plug-ins, Themes and other topics to help you with your beautiful Photo Gallery. Since Menalto Gallery 3 Project announced its hibernation/end-off-life, I switched to Piwigo’s Gallery engine. You can find more about valuation criteria and decision process here. As long time user of G3 there is a history and baggage one have to carry with him. In my case the theme – GreyDragon – needed to be ported to Piwigo along with few modules/plugins. You can find information about them below. This is a custom theme built from ground up, adding many extra options. Theme supports color packs and is based on Default theme for thumb styles. I have decided to not incorporate thumb packs into the theme and rely on plugin approach – see gdThumb plugin for more details. 20+ options to customize the theme provided via theme’s Admin page. Download and unpack package into Piwigo’s themes folder or obtain it using “Add a new theme”. Please post any requests here – forum. But more importantly – continue using it as I believe that user satisfaction is the best reward. If you feel my long evenings provided you with good or plugin, buy me a cup of coffee or two by contributing to my Coffee fund. Any possibility of writing .htaccess rules so that the old gallery 3 URLs will automatically redirect to the new URL structure with piwigo? I’ve got around 11,000 photos in my gallery 3 albums and I’d hate to kill any links I’ve posted on websites that were from my gallery 3 set up. it all depend on how your G3 and PWG are setup as htaccess rules are very specific and sensitive to your url tree structure. Nice work on the theme and the plugin. Inspiring.